Last night I was perusing some blogs of people I know, but am not friends with and it was all, I love my family, I love my husband, I have the best life ever, blah, blah, blah. And I got totally grossed out. And then felt awful for pushing my own version of utopia on you. We get it. Ok. I'm not the only one in love with life. Although, as we speak, I am blogging from our deck whilst the girls romp around in the slip in slide. AND. Stryker did put himself to sleep quietly and without either fussing nor nursing. I need an Iced Tea. Like bad. So obviously this is no where near perfect. Lets take a break completely from my opinions. Gosh. I'm so sick of them. Lets instead take a walk through my most recent adventure and relive all of the gory details together. Yes, hunting. You can liken it to Mushroom Hunting if you would like. I liken it to Wild Game. But that's just me. So. Saturday was the day. The day I finally decided that I would get out and find the Rhubarb. 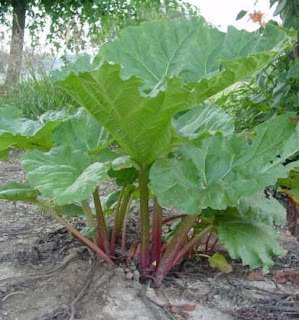 My Landlord has been raving about this Rhubarb for at least a month and I keep promising I will go pick some. Hey. I like to bake. It sounded easy. Find the Rhubarb. Pick the Rhubarb. Bake the Rhubarb. So. Like I said. Saturday. I get the kids dressed for an outdoors exhibition. The girls have shoes on. Stryker is in the good old Baby Bjorn. And we set out. And into the Apple Orchard. I was told that the Rhubarb was out Back. Being the Literal Person that I am. We started looking in the Back of the Orchard. So we looked. And we looked. And we moved some plants around. We steered clear of something I thought looked like Poison Ivy, but in all reality, probably was not. We looked up in the trees for good measure, and out in the fields, just in case what Dwight really meant was that the Farmer was cultivating entire crop loads of the stuff behind the Orchard. Googled the little buggers again. And then turned around and went back into the Orchard in hopes that with the image fresh in my memory, in all of our memories, we could locate the hidden treasure. The girls were very excited at this point. They kept yelling that everything was the illusive Rhubarb. There it is!!! One would shout at a pile of firewood. No, there it is!!! The other would follow up with a clumpy area of grass. Girls. I would say. Please. I like to think you are the smartest children ever created. Stop that right now. Stryker just hung out on the front of me, weighing a million pounds and killing my back. My search was a little bit distracted, in that, we have a bazillion bugs out here and I was constantly swiping at the little darlings face. I realize we were outside, where there tends to be bugs. But come on people. This is what I imagine the evolution cycle to be like if bugs came before the creation of man. We were outside, oh probably 40-45 minutes before I finally got brave enough to rummage around in some overly large greenery. And Great Scot. I found it! A scene right out of some great discovery. As if a man should have walked through the African Bush declaring, "Dr. Livingston I presume." And I should have responded with a series of clicking noises made with my tongue and the girls should have been wearing banana leaves instead of summer dresses. And Stryker probably should have been carrying a spear. That's exactly what it was like. So. We found the Rhubarb. Oh. This is a picture of what Rhubarb looks like. In case you ever find yourself in a hunt for it. But imagine yourself staring down at it from the top. It's not nearly as obvious. So. What do you do after you find Rhubarb? I didn't know. Do you know? Seriously do you? And if so, why didn't you give me a head's up??? So I was back inside Googling. It turns out you pull. But according to the internet, I could do either and it would be easy. Back outside and in front of the plants I continued to stare. I didn't understand how to cut. Or pull. Or hack. Or saw. Or rip. Or do anything. There were these huge, over sized plants in very intimidating groups and I had no idea how to go about disturbing their peaceful growth. So. In the end of all of that I decided to wait for Zach to get home from work, so that he could do it. He got home. I handed him the scissors and said be free. Go my little bird. Be free. I told him specifically I needed four cups worth. He came back with like three stems. Which also. He walked right to it. There was no hunting for him. At this point our landlord had come over and was doing some work. He saw the three little pieces of Rhubarb and laughed. He said, "Well, you're going to need more than that." "Oh," He continued, "You want to pull them from the bottom, up by the roots, so that more can grow in their place." Finally. Some directions I can follow! So. Stella and I went back out to the Rhubarb Garden, Growth, um.... Patch (Scarlett was napping by this point.) and we pulled. And dang it if Stella wasn't better than me at pulling. Stella girl had the magic touch apparently. Or has her father's Green Thumb. Opposed to my Black Plague Thumb Of Death. Anyways. We tore the leaves off. At this point though, I was making things up as I went along. Nobody had instructed the pulling of the leaves. But I was terrified of bugs in my house. Ahem, more bugs in my house.... And so I wanted to leave the leaves behind, if you know what I'm saying. This is the crop Stella and I came back with. That is them washed and drying. I started taking pictures at this point because I realized that the Rhubarb Expedition was taking up the majority of my day and I needed to blog about it in order to feel validated. So. With the Rhubarb dried and waiting, I found an easy-looking-ish recipe for Rhubarb Crisp and got to work. Now the only Rhubarb I had ever had prior to this adventure was Strawberry Rhubarb Pie, which surprisingly tastes a lot like... Strawberries. And the most effort I've ever put into making it, was, "Excuse me, Mr. Village Inn Waiter, I'll have the Free Strawberry Rhubarb Pie with my $1.25 Coffee. Thank you so much." Which. Believe me. That is exhausting. Whew. So. Here I am. Following a recipe. 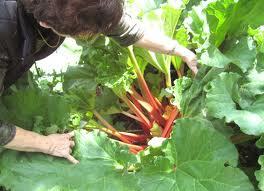 And staring down the damn Rhubarb trying to figure out what to do with it. In the end, the straight forward method of chopping won out. You should know. If you don't already. That Rhubarb is almost the exact consistency of celery. Yes. There was definitely a Panic Attack over the fear that instead of some sweet dessert, I was actually making Celery Crisp and I was too terrified to try a raw piece of the red calorie-less vegetable so Onward I went. I don't know. I didn't measure. But other than that I completely stuck to the exact recipe. Oh. Except I doubled it. But aren't you proud of me? Now that the Damn Rhubarb (This was the loving, endearing term Zach and I started to refer to it as, after the entire day it sucked into its tiny little roots.) was taken care of it was time to make the Crisp Part. Liquid Yumminess Third. By the way, this is supposed to be clear. I used a dirty spoon and this was the color of my clear. Ok. Not dirty dirty. Just the same spoon I mixed the Crisp Part with. Pour that over said Damn Rhubarb Fourth. And then More Crisp on top Fifth. And it comes out looking something like.... This. Because obviously the Oven didn't eat it. But I forgot to take a picture of it in our hurry to get it over to a friend's house. That is how it came home. Should have buttered the dang pan. But other than that! It was amazing. And that is a dish I can be proud of. From Harvest to Meal Time I am the creator of the Glorious Rhubarb Crisp. Today I will be "Hunting" for a fantastic Strawberry Rhubarb Pie Recipe. Oh that's right. Domestication stops for No Man! That is after I clean the house. And find the TV Remote that has been missing for days. And find a Sloppy Joe Recipe for Dinner. And Finish the Dreadful Laundry. And Fold the Dreadful Laundry. And take the kids back outside for some more Fun in the Sun. Ok. So the pie is low on the totem pole. But it will happen. I can officially put finding/pulling Rhubarb in my bag of tricks. But homemade pie crust is a WHOLE different story. And it's definitely not as easy as just hunting.